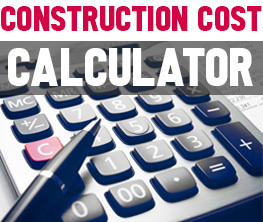 In an office, bright colors can translate into efficiency and productivity, yet they are seldom used. Instead, generic interiors with uninspiring neutral tones bore the employees and tire the eye. However, there are companies that understand that vibrant colors mean a boost in brain power and a worthy rest from boring tasks. These companies turn their offices into colorful interiors, where employees feel revitalized rather that overwhelmed. If you want to follow the example of their lively designs and office wall graphics, here are a few ways to do it. Office partitions don’t have to harshly separate different areas with opaque walls, nor do they have to give up the idea of privacy by using transparent glass. A third option is to use translucent graphics on glass. 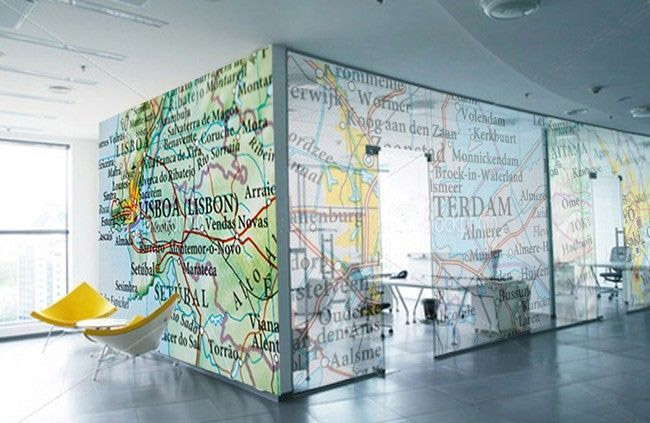 In the office below, an oversize map takes over the walls and glass dividers. A map is an excellent idea, especially if you are in the tourism business. 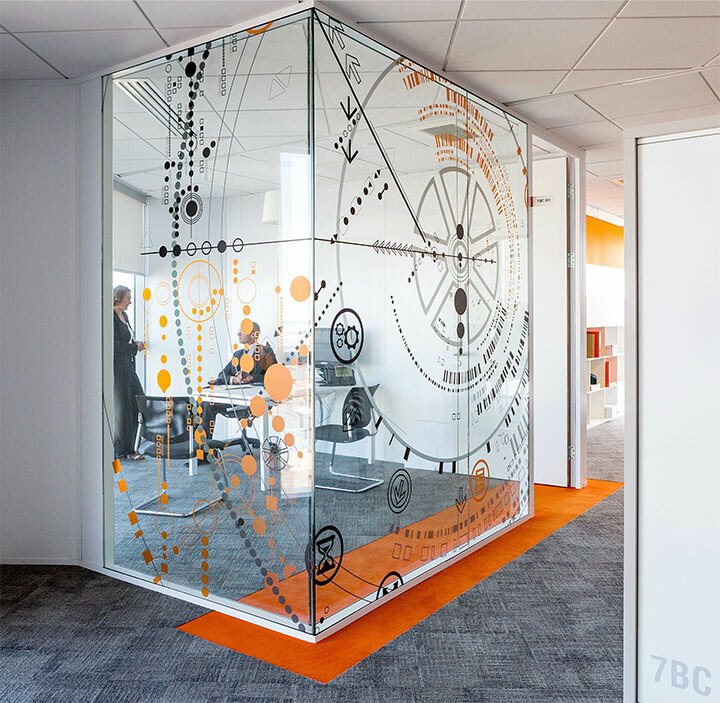 The same concept can make use of themes and colors more suited to your line of business, as in the Saint-Ouen (France) offices designed for Engie, a global energy and services group. The idea is to take full advantage of glass walls as an artistic canvas and bring in color and transparency at the same time, both elements that give a space energy and a lighthearted vibe. 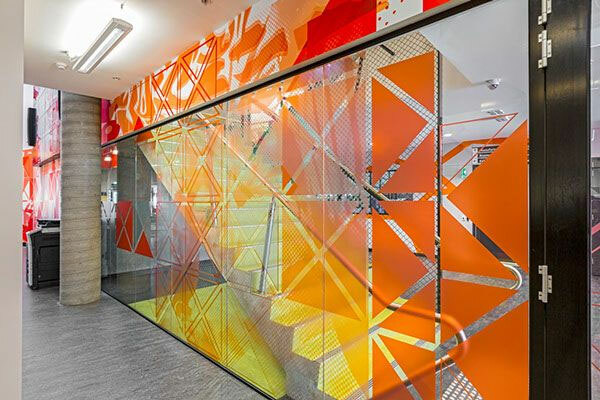 Whether you choose paint or vinyl decals in order to infuse your space with color, you can a achieve a modern artistic look with a geometric artwork, while preserving some of the transparency and visual access from one space to another. 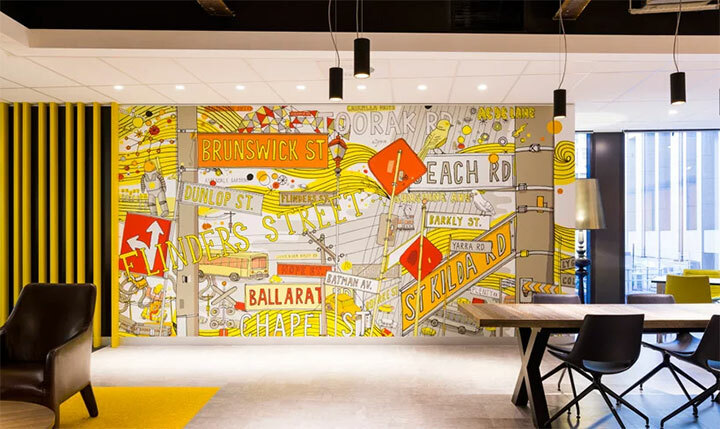 The artwork below, part of a feature wall created by Matt Ryan for the Federation College Ballarat Campus in Australia, has an even deeper meaning, with triangles pointing in different directions suggesting the different choices made by students. Taken into office design territory, geometric artwork can be invested with other meaning and become part of the company’s brand. Created by Renda Helin Design & Interior, the Emre Group offices in Istanbul, Turkey, take a theme and run with it. 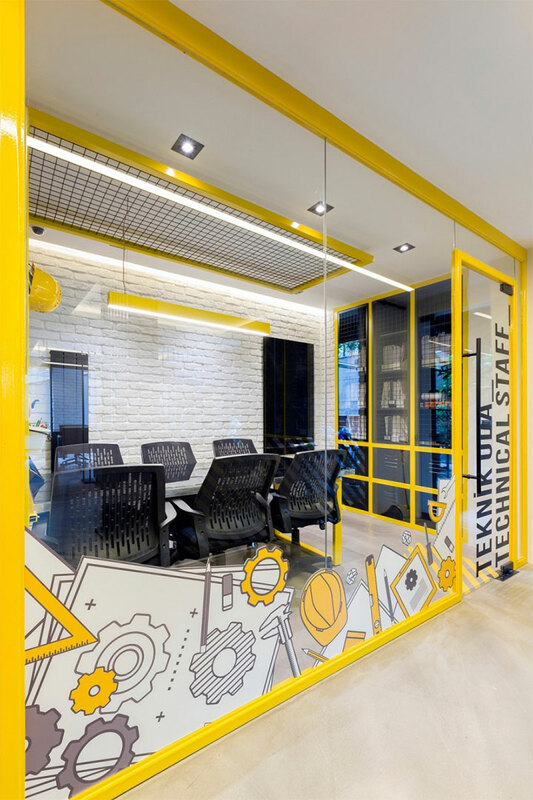 As a manufacturing company, Emre Group enjoys a space that evokes the look of a construction site, with a fitting color palette centered around black and yellow. Urban scenery can take a slightly fun turn and serve as a relaxing tool by inviting the employees to wander through imaginary landscapes. 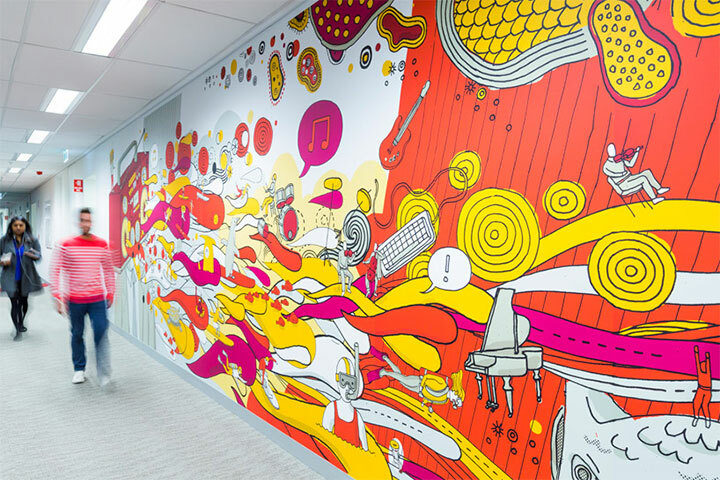 It’s what happens with this colorful mural, part of the office wall graphics created by James Gulliver Hancock for the Commonwealth Bank of Australia in Melbourne, with an interior designed by Sydney-based Frost* Design together with Davenport-Campbell. 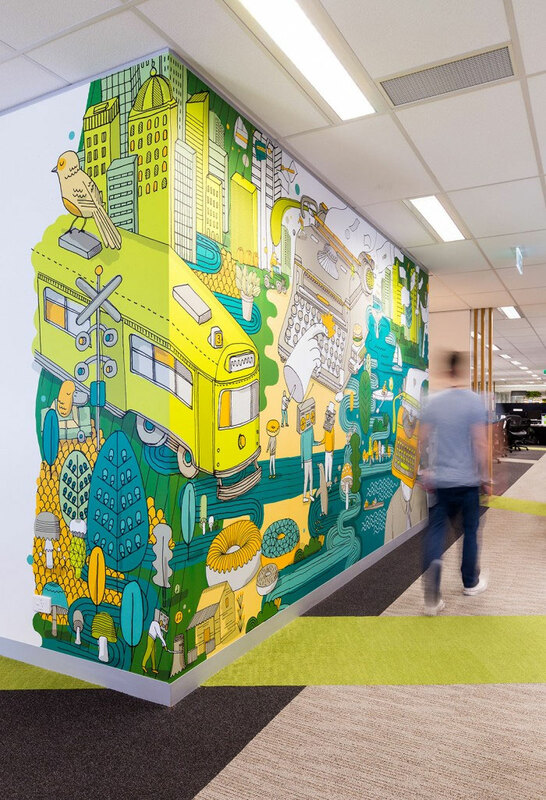 Finally, office wall graphics can serve a functional role, as seen in the same Melbourne offices, where work and rest spaces are defined by different sub-themes, each of them evoking either urban activities or the relaxing beauty of nature. Such inspiring murals create the right kind of mood using only their visual energy.